125K from Fethiye and a notable landmark on the Lycian way, Gelidonya Lighthouse is situated on an dangerous cape east of Finike and due south of the site of Olympus. 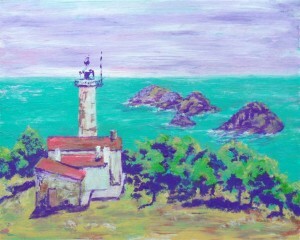 It makes an attractive subject for painting as there are few Turkish lighthouses situated in such a dramatic setting. We are not spoilt with them like those who live around the Atlantic coastline. Costruction began in 1934 and it was lit in 1936, fueled by Kerosene until 1990 and ?? since then. It flashes every 3 secs. and has been run by the Demir family since 1944. Gelidonia Headland and the islands are very important to Lycia’s geography and the history of navigation. It’s the most dangerous part of the Bay of Antalya due to opposing currents and to pass was quite hard (I bet!!) in antique times. The flows have pulled many ships onto the rocks and have changed the place to an underwater cemetary (sic)…..
My first painting has again been done with a very restricted choice of turquoise, yellow, red and white and although there is limited potential when mixing acrylic paints, I hope and feel that I have managed to convey a sense of harmony in this landscape after making that decision. 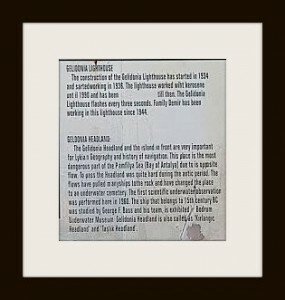 This entry was posted in Fethiye, Living in Turkey and tagged Acrylics, Gelidonya Lighthouse, Lycian Way on April 27, 2013 by Tony Taylor.